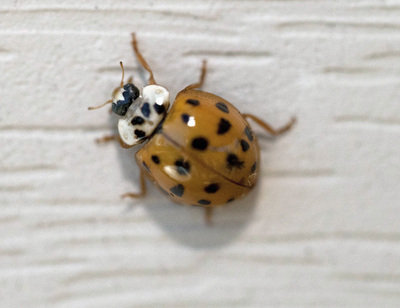 The Asian Lady Beetle (Harmonia axyridis) is not what we have typically come to think of as the average garden ladybug. 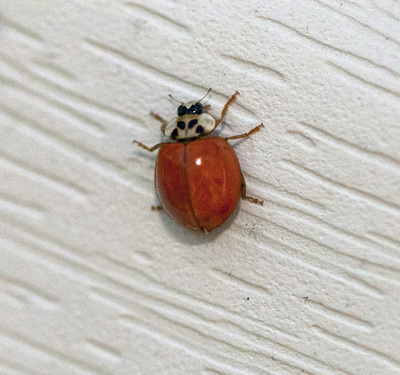 These beetles are an invasive species from eastern Asia that have recently become home invaders in most areas of the country. The Asian Lady Beetle looks similar to other lady beetles and are similar in size (about 1/3" in length), but body color varies tremendously among the Asian Lady Beetles and can range from browns to yellows to reds within the same area. Many of these beetles have black spots but some may lack spots entirely or have only a few spots. There is one field mark, however, that can be used to identify these beetles. They have a black "M" on their thorax, just in front of the wing covers (look on the white area in the picture on the left, above). The "M" marks can vary between individuals, but usually can be used to identify that this is the invasive species of lady beetle. These lady beetles, just like the ones native to this country, control some outdoor pests; however, they have the annoying and unusual habit of clustering together in large numbers on the sides of and inside buildings in the late fall. They seem to be most attracted to buildings where there are sudden color contrasts such as would be found with dark shutters on a light colored house. They also seem to prefer southwest-facing or very illuminated sides of buildings that are close to trees or woods. When the temperatures fall, these beetles move into cracks and eventually find their ways into homes where they eventually hibernate only to come out later in the spring. Fortunately, these beetles are not harmful, but they are quite annoying. Where my house is located (it is a tan house with hunter green shutters in the middle of the woods), these beetles become quite an annoyance, and seem to get caught in my basement stairwell where they soon can be found by the hundreds. Unfortunately, when disturbed, these beetles excrete a brownish substance that smells bad and will stain walls, woodwork, etc. 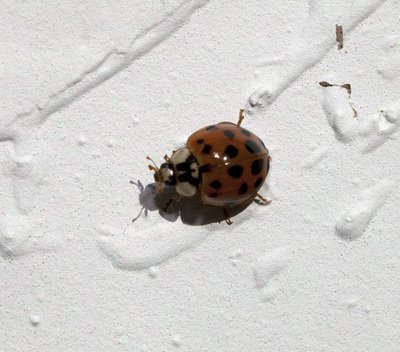 Click here for even more information on the Asian Lady Beetle including methods you can use to control it.